New York City AM radio has a presence in my neck of the woods. So over the years at different times, I have been a regular listener of WABC, WCBS, WFAN, WINS, WOR and WNBC—AM stations whose daytime and nighttime coverage area included my hometown, Waterbury, Connecticut and thereabouts. 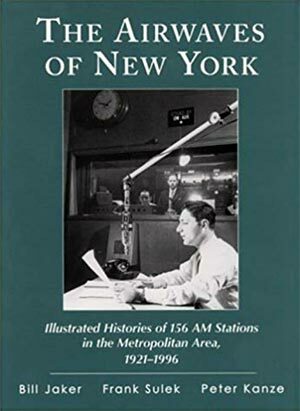 Being a New York City radio fan as well as a student of radio history, I purchased The Airwaves of New York, subtitled Illustrated Histories of 156 AM Stations in the Metropolitan Area, 1921-1996 as soon as I saw it while book browsing books on Amazon recently. The first chapter of the book concentrates on the history of AM radio in New York City and briefly touches upon the history of FM radio and television. The book is well illustrated with photos of the radio stations and the people who staffed the stations. I enjoyed reading the book and recommend it.